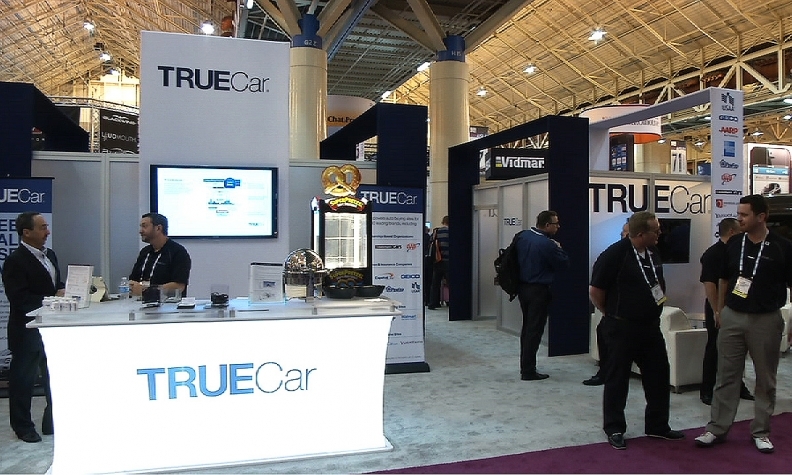 The TrueCar booth at NADA 2015 in January. LOS ANGELES -- TrueCar’s legal woes mounted Wednesday as the online car-buying service was hit with a shareholder lawsuit alleging that it misled its investors about how it does business. The suit, filed in federal court in Los Angeles, seeks class-action status on behalf of shareholders who sustained losses on TrueCar stock since its May 2014 initial public offering, and opens up a new avenue of attack against the company, which has had a history of run-ins with state regulators and conflicts with auto dealers within and outside its network. The shareholder suit cites declines in TrueCar’s stock price following two other lawsuits against the company. In March, a group of dealers representing 174 franchises outside TrueCar’s network filed a lawsuit in New York claiming TrueCar was falsely advertising that shoppers could use its site to avoid price negotiations. That suit seeks more than $250 million in damages. The day after that suit was filed, TrueCar’s stock price fell 2.7 percent, the latest complaint says. This month, the California New Car Dealers Association charged in a lawsuit that TrueCar functions as a car dealer and broker without proper licenses. That suits seeks clarification within California’s law. As a result of the CNCDA’s May 20 suit, the shareholder complaint alleges, TrueCar’s stock price tumbled 6.9 percent on the news. “As a result of defendants’ wrongful acts and omissions, and the precipitous decline in the market value of the Company’s securities, Plaintiff and other Class members have suffered significant losses and damages,” the suit reads. The shareholder suit seeks damages on behalf of all investors who bought TrueCar stock between May 16, 2014, and May 20, 2015, and suffered losses during that period. TrueCar has called both the CNCDA’s suit and the New York suit meritless and said it plans to fight each vigorously in court. “It’s just a true fact that when you have a disruptive technology like ours, like Uber or Airbnb, you get challenged on many legals fronts," said Johnny Stephenson, TrueCar's chief risk officer. "We understand that. That’s what the courts are for. It’s just an unfortunate side effect of innovation." TrueCar’s site allows consumers to get a guaranteed price on a specific vehicle from a certified dealer. In most states, dealers pay TrueCar $299 for every new-car sale the site generates and $399 for every used-car sale. It also operates car-shopping websites for affinity partners. TrueCar shares fell 3 cents today to close at $14.02.